Jupiter is the largest planet in our solar system, and it might also be the oldest. Jupiter is the largest planet in our solar system, and it might also be the oldest. According to a new study, researchers have found evidence that Jupiter is the oldest of the planets thanks to an analysis of 19 meteorite samples on Earth. The new analysis suggests that Jupiter formed only about 1 million years after the dawn of the Solar System 4.5 billion years ago. Researchers examining the meteorites found that they appear to be formed from two different reserves of material in the early Solar System. Long story short: Jupiter formed so quickly and was so giant that it kept two different reserves of early planetary material from intermingling in the early days of the Solar System. Kruijer and the team of researchers were able to differentiate between the two reservoirs of material by measuring isotopes in the meteorite samples. They found that each set of material did exist within the same period of time in the early Solar System, but they didn’t intermix, meaning that something — in this case, Jupiter — must have been keeping them separated. Scientists can’t directly measure meteorites from Jupiter because we don’t have any. “We do not have any samples from Jupiter, in contrast to other bodies like the Earth, Mars, the Moon and asteroids,” Kruijer said. “In our study, we use isotope signatures of meteorites (which are derived from asteroids) to infer Jupiter’s age.” These results are far from a sure thing, and it’ll still take more research to figure out exactly when and how Jupiter formed in the early days of the Solar System. 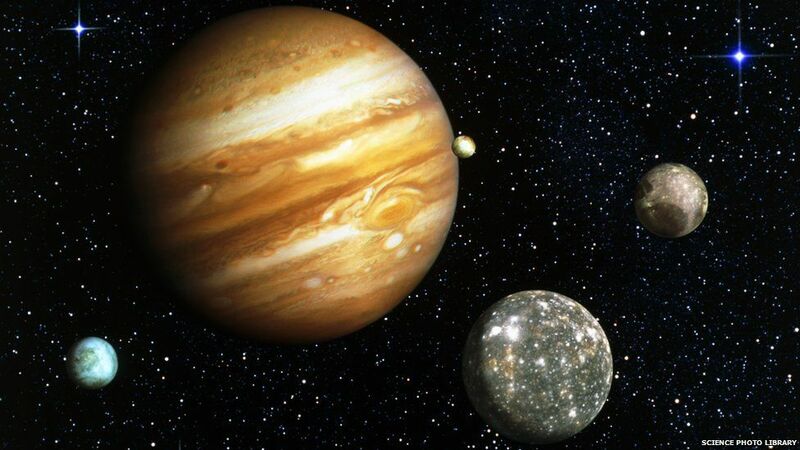 In fact, Jupiter’s satellites form a shrunken version of a full planetary system: from the tightly bound larger Galilean moons (orbiting in their Laplacian mean-motion resonances, akin to places like the exoplanet system Trappist-1) to the remarkable array of smaller moonlets that encircle this world out to more than 30 million kilometers. These bodies circle Jupiter in anywhere from about 7 hours to an astonishing 1,000 days. Until recently, the cataloged satellites totaled 67 in number. But only the innermost 15 of these orbit Jupiter in a prograde sense (in the direction of the planet’s spin). The rest are retrograding, and are likely captured objects—other pieces of the Solar System’s solid inventory that strayed into Jupiter’s gravitational grasp. That population of outer moons is mostly small stuff, only a few are 20-60 kilometers in diameter, most are barely 1-2 kilometers in size, and increasingly difficult to spot. Now astronomers Scott Sheppard, David Tholen, and Chadwick Trujillo have added two more; bringing Jupiter’s moon count to 69.